The time consuming aspect of cooking is not the cooking, but getting everything ready to cook — what in our kitchens we call prep. Prep is more a matter of organization than skill. In this video I show you how to set-up your “prep area” for maximum productivity. The more productive you are, the quicker your prep work will go. The time consuming aspect of cooking is not the cooking, but getting everything ready to cook — what in our kitchens we call prep. Prep is more a matter of organization than skill. In this video I show you how to set-up your “prep area” for maximum productivity. The more productive you are, the quicker your prep work will go. At Home is filled with advice on how to turn cooking from a chore to a pleasure. View Video. Revisit the How to Chop an Onion Video. Starting off any party with a well-chosen House Cocktail is a excellent way to set a festive tone for your guests. Part 2 of At Home by Steve Poses begins with a section called Welcoming Guests and includes lots of options for you including Four Seasons of Champagne Cocktails. A favorite is Champagne with Cranberry — especially apt for your Thanksgiving. Use a moderate quality sparkling wine like prosecco or cava or moderate priced champagne rather than fine champagne. Also an excellent gift to bring to a Thanksgiving to which you are invited! Do Ahead Sweetened cranberry juice and optional candied cranberries may be made up to 10 days ahead and refrigerated. Combine cranberries and water in saucepan and simmer over medium heat for 5-7 minutes. Remove from heat and cool. Puree in blender or food processor and strain through a fine strainer. Stir in simple syrup. This will make a sweetened fresh cranberry juice. Your ratio in the recipe is 2 parts sparkling wine to 1 part sweetened fresh cranberry juice. It is important that sparkling wine and juice be well chilled. Pour sparkling wine into a wide pitcher or large measuring cup. Allow foam to subside. Slowly add a small amount of the sweetened cranberry juice. It will foam again. Let foam subside again and add more continuing until all juice has been added. Immediately pour into champagne or wine glass. It will again foam so go slowly. Serve immediately. If you have extra, keep in refrigerator where it will hold its sparkle for at least a half hour. These yummy candied cranberries make a fun but totally optional garnish. Combine cranberries and simple syrup in a sauce pan. Bring to rapid boil and cook over moderate high heat. Cranberries will swell and pop. Continue cooking for 8-10 minutes as syrup thickens. With a spoon, transfer cranberries to wax paper or parchment. Cranberries will now shrivel. Allow to cool and refrigerate. Add 3-4 candied cranberries to cocktail. You can save the syrup and use to make a cranberry “soda” by combining with seltzer or use on top of a little pound cake or other Thanksgiving dessert. Note: Simple syrup is the combination of equal parts sugar and water, heated until the sugar is fully dissolved. Combine sugar and water in sauce pot over low-moderate heat, stirring until sugar is fully dissolved and liquid clear. If you make only the sweetened cranberry juice combine 1 cup sugar and 1 cup water to yield 1 1/2 cups simple syrup. If you also do the candied cranberries, combine 1 2/3 cups sugar and 1 2/3 cups water for a total of 2 1/2 cups, divided. Simple syrup has many uses and stores in your refrigerator for weeks. 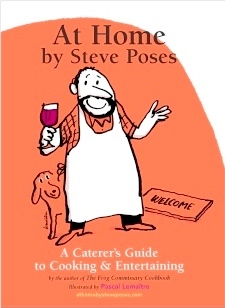 At Home by Steve Poses: A Caterer’s Guide to Cooking & Entertaining with At Home Online, the companion website for book owners, is the perfect house gift to bring to your Thanksgiving host. At Home is not available in bookstores, but only from athomebysteveposes.com. Order today in time for Thanksgiving. Look for our At Home table in the Center Court of Reading Terminal Market on weekends between now and the end of December. If you have not been to the Reading Terminal Market recently, you are missing one of the great treasures of Philadelphia. And there is no more exciting time to be there than the holiday season. My sous-chefs will be there all day to sell books and I will be there as much as I can to sign books. All books come with book-owner’s access to At Home Online, our companion website. I will be signing books at Weaver’s Way Co-op in Mt. Airy from 11 AM to 2 PM on the Saturday before Christmas. Weaver’s Way Co-op, a natural foods grocery, is at 559 Carpenter Lane at Green Street. My goal for home entertainers is one relaxed hour prior to guests arrival. The key to getting your hour is getting as much done ahead of time as possible. That simply requires a little planning. I always counsel one full weekend before your party. In the case of Thanksgiving — the Superbowl of Home Entertaining — I counsel two full weekends. That means you need to use this weekend well. According to our At Home Thanksgiving Planner, your focus this weekend should be on Menu Planning and Organizing Tasks and Time. Identify make-ahead dishes and avoid last minute dishes. Make Shopping List (also included with the Planner) by reviewing all recipe. Save time by organizing by market aisle and or type of store and check list against what you already have. This is weekend to assess you tabletop — especially if you need to add to your collection of platters and bowls. Also, check your supply of candles. Contact guests and assign dishes or other tasks. Make your shopping schedule. Shopping tasks are ideal tasks to assign to others. 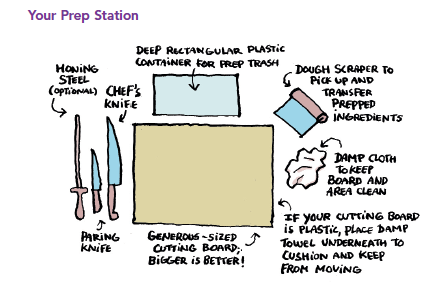 Plan you prep work and cooking. You can certainly make the Gingered Cranberry Orange Sauce from Wednesday’s blog. Purchase all of your beverages, including wine and alcohol. These are onions. There are lots of these in your life between now and year’s end. Learn how to make chopping onions easier. I have shared with you my mission which is to increase home entertaining nationally by 10%. My reason is simple. I believe in the essential importance of human connection. And there is no better way to make that connection than to share the warmth of you home and a good meal. I understand that you may feel home entertaining can be difficult. So, if I am to accomplish my mission and get you to entertain at home more, I need to help make it easier. Vegetable prep is the most time consuming aspect of cooking. And chopping onions is probably the task you do most. To help make it easier to chop an onion, I have made a short video — How to Chop an Onion. I hope you find it useful and, if so, pass it along to others who you know struggle with onion chopping. Numbers of readers have offered great suggestions for our list. Please post your suggestions for What Guests Can Do To Help on this blog by using the “Leave a Comment” under this post or send an email to me at steve@athomebysteveposes.com.I need your help now to come up with a great list to share with Thanksgiving hosts and I will need your help later in sharing the list. Let’s work on this together over the next two weeks. At Home by Steve Poses: A Caterer’s Guide to Cooking & Entertaining with At Home Online, the companion website for book owners, is the perfect house gift to bring to your Thanksgiving host. At Home is not available in bookstores, but only from athomebysteveposes.com. Order now in plenty of time for Thanksgiving. Vegetable prep is the most time consuming aspect of cooking. And chopping onions is probably the task you do most. To help make it easier to chop an onion, I have made a short video. hope you find it useful and, if so, pass it along to others who you know struggle with onion chopping.